Laughs galore! Comedy bits, blackouts, funny lines, complete presentations and humorous bits of business for mentalists, magicians and psychic entertainers. When first published, this was the first and only comprehensive book on the subject. Comedy bits, effects and full routines by Bob Nelson, Karrell Fox, George Johnstone, Alan Millan, The Amazing Maurice, North Bigbee, Sid Lorraine, George McAthy, Robert Tripp and Ben Franklin IV. 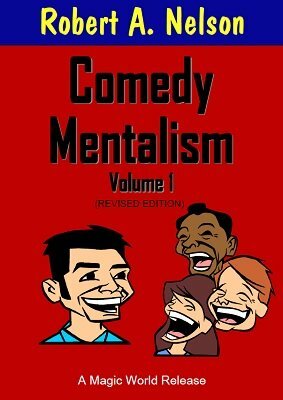 Top-notch material for every occasion, including a complete two-person comedy act by Bob Nelson and a complete comedy Talking Skull routine by George McAthy. PLUS: A BONUS OF THREE PSYCHIC GEMS. These three serious routines alone are worth more than the price of the complete book for any mentalist. 1st edition 1962; revised digital edition 2017, 96 pages.